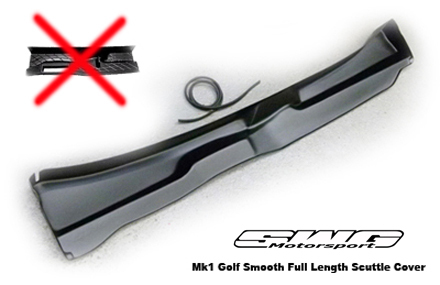 DESCRIPTION WE are very proud to offer our new Mk1 Golf smooth one-piece scuttle cover designed and manufactured exclusively by SWG Motorsport here in the UK. 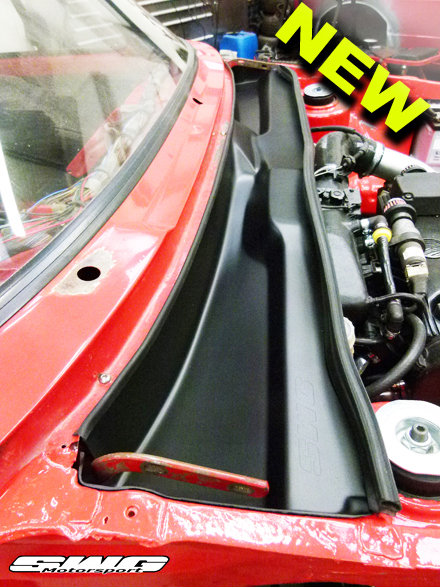 Our brand new design replaces the old and very fragile original short plastic cover (found on all mk1 Golf's) with a smooth full length 1 piece item that fits across the entire bay from wing to wing, this unique tub design gives full protection from the elements and completely covers the heater fan and wiper motor area. This SWG panel is not simply a flat piece of plastic but a specially sculptured panel designed around the contours of the Mk1 bay and very closely mimics the shape of the original item, so keeping a very OE look to the classic Golf engine bay. Our new cover also utilises existing mounting points (no drilling) and comes complete with bespoke brackets, stainless fittings and rubber edging and simple to follow fitting instructions (Note: uses your existing cover's rubber under bonnet seal). Designed to fit all Mk1 Golfs (including cabriolets). This is an ideal finishing touch to any Mk1 engine bay whether it's a full on show car or a cherished daily driver. Supplied in two finishes OE style Matt black finish and also a Gloss Black finish, both ready to fit (Please choose from the options below when placing an order).